There are not many phrases more evocative than “THE FUTURE”. Whether in joyous expectation or fear (of a mixture of both), imagining, predicting, envisioning, and forecasting The Future has been one of humanity’s longest obsessions - and indeed, many religious and social practices, going back to the most ancient of times, are concerned with prognostication. But, beyond the products of imagination (literature, art, and film), where can one actually go to get a tangible touch, a taste of the future? Not a virtual reality version, but rather an experience where one can actually wander around samples of a futurific world? The answer is—or rather, was—world’s fairs. Humans also have a taste for novelty, adventure, the exotic, and news from beyond our borders (and products, material and cultural.) One phenomenon brings such appetites together with our fascination with the future: World’s Fairs. For countries, their industrial, consumer, and agricultural products would be featured, along with something of the nation’s culture—and generally there would be a lauding of the leaders, government, and “way of life”. Companies, too, would extol their accomplishments, productive might, and the quality of their products. Most interestingly, they would often present displays about the forefront - The Future - of technology in their field. Sometimes such demonstrations were startlingly dramatic, but sometimes amusingly humanizing—like the talking (and joking) robot, Elektro (with his robot dog, Sparko), who were featured in the Westinghouse pavilion of the 1939-1940 New York World’s Fair. One of the most famous pavilions of the 1939-1940 New Fair was the “Futurama” exhibit created by Norman Bel Geddes for General Motors: using architecture, and giant, detailed, moving, and carefully lit models, it showed kinetic, luminous visions of tomorrow, beguiling visitors with an image of a motorized utopia. Upon leaving, attendees were given a button that read “I Have Seen The Future”—and no they doubt felt they had. NEW YORK AND THE FUTURE—AGAIN! The New York World’s Fair, spoken of above - considered to be one of the greatest fairs of all - took place in 1939 and 1940, just before World War Two. But well after that war - in the midst of the 60’s, one of the USA’s most economically & militarily strong (and socially vibrant) periods - a second world’s fair was held in New York City. 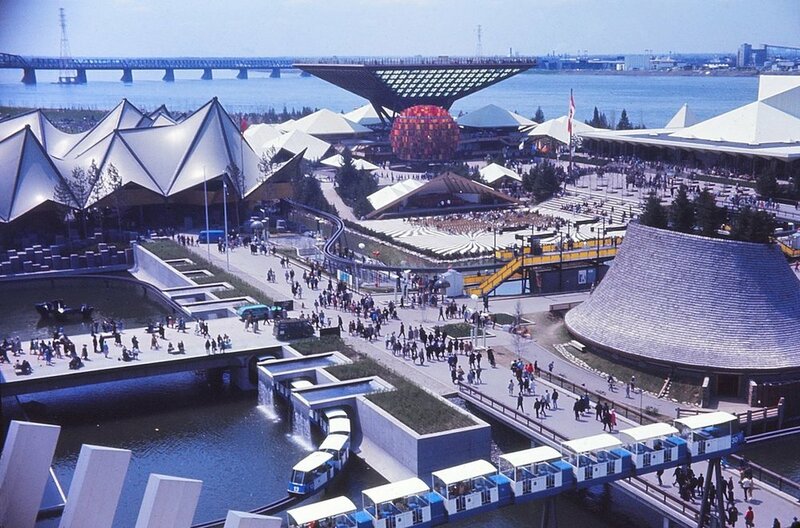 That fair—the 1964-1965 New York World’s Fair—was planned on the same pattern as the previous one: countries, companies, and groups each showing themselves off—only this time, with updated images of the future. For better-or-worse, the world had moved from planes to jets, from vacuum tubes to transistors, and from hydro to atomic power. The Future had new horizons—and that future was: Outer Space. For the 1939 New York World’s Fair, that symbol had been the Trylon and Perisphere: these were huge platonic forms - a gigantic sphere and a spiky, towering, elongated tetrahedron (designed by Harrison and Fouilhoux). They were large enough for visitors to enter, and there was an exhibit inside about the city of the future (designed by Henry Dreyfuss). Concrete may be hard and heavy—but it can be manipulated make soaring structures of deft grace and even visual nimbleness. Nor does the concrete industry want to be thought of as stodgy, as they are always showing that they are moving ahead with forward-looking research and engineering—indeed, the American Concrete Institute once produced a set of research findings and projections on the possibility of using their material in a non-terrestrial environment, a book called “Lunar Concrete”! Like other trade associations and companies, the Portland Cement Association wanted to be represented at the fair—and in a very forward-looking way. 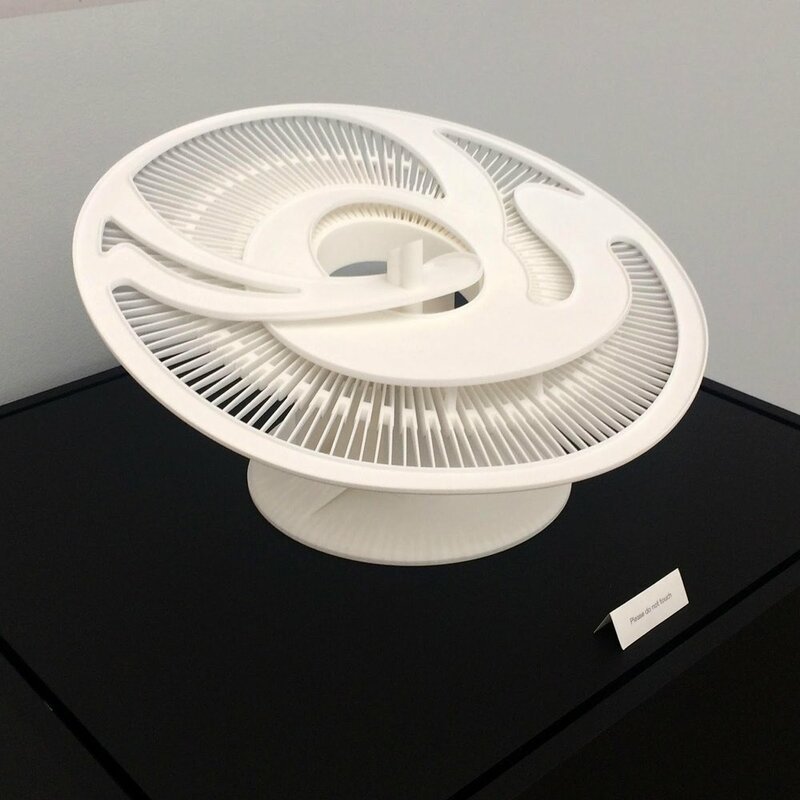 So they put forward a design for the fair’s central, symbolic structure—one that would embody a feeling of future-oriented optimism (and, of course, use portland cement! )—and they hired Paul Rudolph to design it. Paul Rudolph came up with one of his most daring designs—and, given that Rudolph was one of the world’s most adventurous architects, that’s saying a lot. “The Galaxon, a concrete ‘space park’ designed by Paul Rudolph, head of the Department of Architecture at Yale University, has been announced by the Portland Cement Association as ‘a proposed project’ for the 1964 New York World’s Fair. Its cost is estimated at $4 million. Commissioned by the P.C.A. 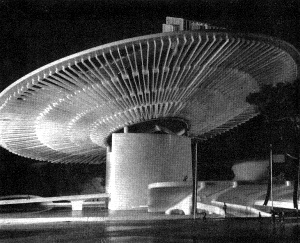 as ‘a dramatic and imaginative design in concrete,’ the Galaxon consists of a giant, saucer-shaped platform tilted at an 18-degree angle to the earth and held high above it by two curved walls rising from a circular lagoon. The gleaming 300-foot diameter disc of reinforced concrete would hover in the air like some huge space ship. Visitors would be lifted to the center of the ‘saucer’ by escalators and elevators inside the curved supporting walls. From the central ring they would walk outward over curved ramps to a constantly moving sidewalk on the disc’s outside perimeter. The sidewalk would rise and fall from the 160-foot high apex of the inclined disc, to a low point approximately 70-feet above the ground. Rudolph did not disappoint—and he created drawings and a model to convey his striking design. The drawings themselves are impressive, with the main one stretching to nearly 20 feet long. Drawing of night view (with spotlights). Image: "Remembering the Future," "Something for Everyone: Robert Moses and the Fair" by Marc H. Miller, published to accompany the 1989 Queens Museum exhibition "Remembering the Future: The New York World's Fair from 1939 to 1964." Among the several many designs that Moses rejected was the Galaxon. And so another structure was chosen, the Unisphere (made from a rather different material: stainless steel - and sponsored by a major manufacturer: US Steel). The Unisphere—still in place after all these years—admittedly has some uplifting visual power, and does still speak to the goal of a unified world. But it’s not the forward-looking, FUTURE-evoking, space-expansive, upward-aspiring GALAXON. Fortunately, we have Rudolph’s beautifully drawn visions to sustain our dreams. When the Galaxon was originally proposed, it got some press—and it has since also appeared or been mentioned in books on Rudolph, and been on-exhibit. Paul Rudolph was known for his virtuoso presentation drawings (especially perspectives and sections), and Paul Rudolph: Drawings is a beautiful, large book of them. It was edited by Yukio Futagawa, and published by A.D.A Edita Tokyo Co., Ltd. In 1972. The book includes a well-reproduced perspective view and a section of the Galaxon. The preponderance of Paul Rudolph’s architectural drawings (well over 300,000 documents!) are in the Library of Congress. The collection includes several fascinating drawings of the Galaxon, which have been scanned and can be seen on-line. From the Library of Congress, impressively large, full-size reproductions of Paul Rudolph’s Galaxon drawing were made, which were very prominently displayed in the exhibit, Never Built New York (which was on-view at the Queens Museum from 2017-2018.) While the Galaxon didn’t make it into the exhibit’s catalog (the curators discovered it after the book had gone to press), the catalog is still well worth obtaining, as it is an exceptionally rich collection of visionary proposals for New York City - and it does include other fascinating projects designed by Paul Rudolph.